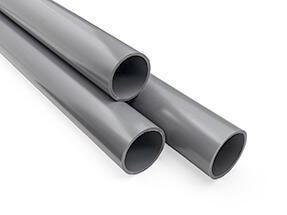 ABS pipe tends to be selected over PVC in applications where there are low temperatures, where there is a risk of pipe shattering (for example with compressed gasses or sudden impact) or where chemical profile of the medium travelling through the pipe is not suited to PVC. ABS is far more ductile than PVC and so is less likely to crack if impacted at low temperatures and can operate at temperatures from as low as -40°C and up to 70°C. If you are unsure whether to choose ABS or PVC pipe, it is best call or email our office and we will help you find the best solution for your system. The inch measurement that specifies the size of an ABS pipe does not, unfortunately relate to an exact measurement of either the internal or external diameter. Instead, it relates to the approximate bore of the pipe (the technical term for this is nominal bore) The actual measurements of the pipe including wall thickness and internal / external diameters are shown out in a table below for the different pipe classes. Class C is 9 bar operational, Class D is 12 bar (but not many sizes are manufactured in this class) and Class E is 15 bar operating pressure. Ice slurries - Pumping of slurries at temperatures near or below zero is a frequent necessity in the food manufacturing industry. ABS pipe is particularly well suited to this as it is taint free, approved for potable water (WRAS approved) and retains a high impact strength down to -40C and below. At these kinds of temperatures, other materials such as PVC and PP become increasingly brittle, heightening the chance of breakage and production line down time. You will find that ABS pipe is often selected as the best solution for ice cream factories and other chilled or frozen food lines. Glycol Circuits - ABS is increasingly replacing Steel and other materials for chiller circuits operating at cold temperatures. The ductility of ABS pipe and fittings mean that they retain a good mechanical strength to very low temperatures (-40C). ABS systems are also far quicker and easier to modify and/or repair than steel. 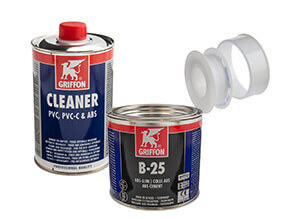 ABS is often used in processes where chemicals are used that would otherwise compromise other plastics such as PVC. It offers a different solution for the engineer.